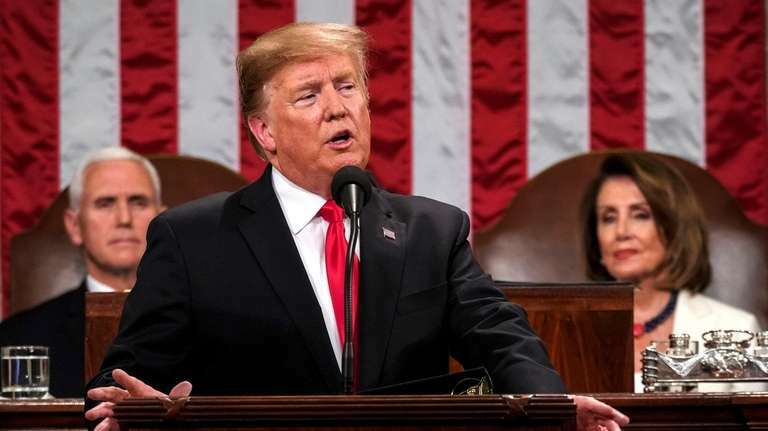 Here are 13 quotes that stood out from President Donald Trump's second State of the Union address, delivered Tuesday night. After urging Congress to fund the government, protect the homeland and secure the southern border by Feb. 15 — the deadline to avert another shutdown — Trump framed the issue in these terms: "This is a moral issue. The lawless state of our southern border is a threat to the safety, security and financial well-being of all Americans." Addressing the long war in Afghanistan, the president said his administration is negotiating with Afghan groups including the Taliban. He declared "the hour has come to at least try for peace. And the other side would like to do the same thing. It’s time." "Tonight, I'm asking you to defend our very dangerous southern border out of love and devotion to our fellow citizens and to our country. No issue better illustrates the divide between America's working class and America's political class than illegal immigration. Wealthy politicians and donors push for open borders while living their lives behind walls and gates and guards." Long Island delegation reacts to speech"You can't talk about unity and then devote such a large portion of your speech ... Janison: For once, Trump could answer his riddlesHis State of the Union address Tuesday would seem a perfect time to satisfy citizens' curiosity on myriad issues. But the president hasn't been one for elucidation. The story of Trump's second year in 12 momentsA look at Year 2 of the Trump era, from the Parkland shooting to the longest government shutdown in the country's history. Will Trump’s next 2 years be better or worse?We're halfway through President Donald Trump's four-year term, which began on Jan. 20, 2017.